John Dawson, itsthevicar.com, offers a comprehensive service to businesses, organisations, groups and individuals covering a variety of functions and occasions. Whether it is a corporate function, gala dinner or private wedding, itsthevicar.com can add that special touch to your occasion. 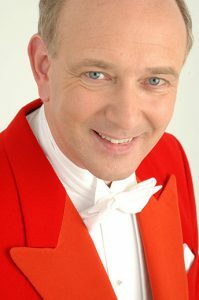 You can choose from a wide range of options for the appropriate ‘front man’ you want itsthevicar.com to be; Toastmaster/Master of Ceremonies – Compère/Presenter – Promotional Host – Charity Auctioneer – Town Crier – Commentator. Whatever your requirements are, John Dawson can adapt his style to suit your particular needs; he will continually liaise with all concerned to guarantee that every aspect of the occasion is covered and to ensure that the event is one to remember. For organisations who require an after dinner speaker, they can take a step back in time with the History, Dress and Role of a toastmaster, a humorous and informative talk or, have a light hearted relaxing time. 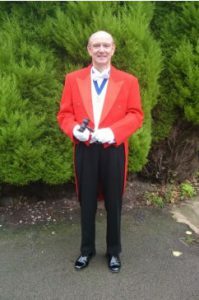 He is conversant with the necessary protocol and etiquette necessary for special occasions having trained with the London Guild of Toastmaster and is Vice President of the Northern Guild of Toastmasters, becoming President in 2018. Since 2015, John has been the official Mace Bearer for Hedon Town Council and a member of Hull and Humber Chamber of Commerce. Although living in a village just outside of Hull, East Yorkshire, he is prepared to travel throughout Britain or internationally if required. The Master of Ceremonies is the “conductor” of an event or meeting. The primary responsibility of the Master of Ceremonies is to serve as a genial host. Having John Dawson as your M.C., he is a person who has bearing and presence who can command the attention of an audience. The Master of Ceremonies is responsible for ensuring that the programme of events runs smoothly, runs on time and that all important people at the event are introduced in a complimentary and professional manner. 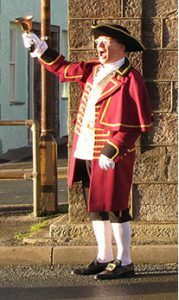 John Dawson as town crier is a person who is employed to make public announcements in the streets or at functions such as product launches, weddings, fetes and promotions. He can also be used in court or for official announcements such as Royal proclamations, local by laws, market days and adverts. He carries a hand bell to attract people’s attention, shouting the words “Oyez Oyez!” before making the announcements. The word “Oyez” means “hear ye,” which is a call for silence and attention.